Catholic Icing's Holy Week File Folder game is fabulous for remembering what happened each day this week. You can change or delete any questions that are not applicable to Protestants. We really enjoyed it last year and I'm planning to pull it out again this week. 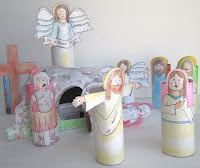 Also from Catholic Icing is this wonderful Resurrection set that you can print and make with cardboard tubes and an empty tissue box. You could work on this all week. And just one more from Catholic Icing (that lady is full of ideas!) - this Last Supper craft. Amazing. Calvary Chapel's curriculum is full of great lessons, coloring sheets, and puzzles. Start at about Lesson 220 and you'll find lots of good stuff for this week through about Lesson 240. This one's for the moms:Today's Fabulous Finds has Easter subway art. Print, frame, done. Makes a nice hostess gift too. Homeschool Goodies has this chocolate crown of thorns. Seems like a strange thing to make,but it might work. How to Make an Easter Garden from A Holy Experience. The way that they use it is even more beautiful than the project itself. I really want to do this, but I may have to save it for next year since I still haven't come up with the right basket. There are some cute printable cards and bookmarks in this free Take Me Home - He has Risen! set at Currclick. The Easter Holiday Helper from Living Books Curriculum is a pdf of Charlotte Mason style resources. Poetry, fine art studies, stories, and copywork suggestions - and the price is right! And the Old Schoolhouse Magazine has three free downloads: Go check them out, I'm too tired to explain, but you'll like them. Got kids you love in another city? 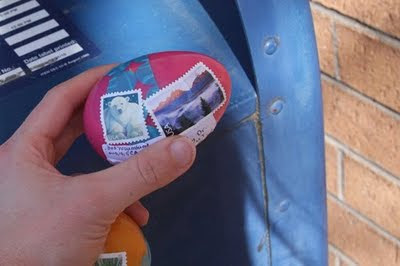 Apparently Plastic Eggs are 13 Ounces or Less, and according to Giverslog, you can mail them. And don't get rid of those old Easter eggs. 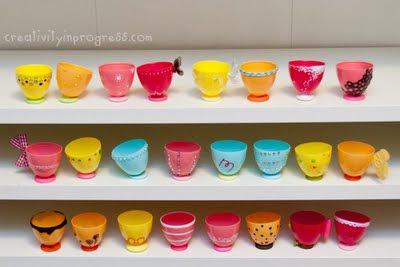 How cute are these Easter egg tea cups from Creativity In Progress?? That's all for now. Teach your children. Show them the story. We borrowed The Visual Bible:Matthew to enjoy in the spaces this week. And have a wonderful Easter!